Another big release will be off the press in a moment. 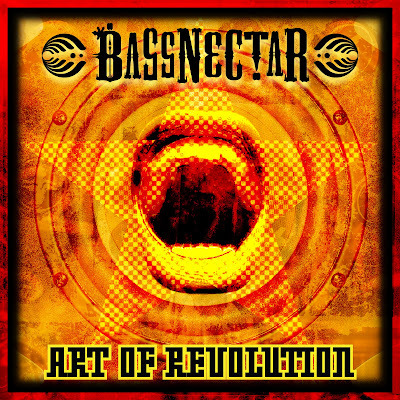 American bass don, Bassnectar has finally decided to release his heavy-weight dubstep anthem Art of Revolution on a limited 12 inch vinyl (of course also available digitally) plus a set of remixes by good ole’ pirate maytees Diplo, Ghislain Poirier, 6Blocc and Product 01. Quite a nice selection I’d say. Art of Revolution features legendary Jamaican vocalist Tapper Zukie (well, Jamaican ragga vocalists seem to be in big demand recently). I can really understand why people were grooving so much about this track when hearing it during Bassnectar’s gigs. Actually they probably heard the Super Styling smashup that is Art of Revolution mashed with Super Stylin by Groove Armada (check bassnectar.net for free download of this track). Art of Revolution is a straightforward dancefloor smasher with heavy sub-bass pulsing with energy in a trademark Bassnectar’s style. The tracks builds up nicely in a very melodic way with Jamaican vocals adding the spice to it and then – OMG – I f….g love when bass drops with such a heavy metallic force. My limbs would adore me if I only had a chance to see this track rotated live on some good sound system. The package comes with four remixes. In his remix, Diplo added more drums making the track more steppy, deconstructed it seriously, slowed down and ‘spread’ the main bassline and gave an entire track a more slow-burning banger twist (so typical for this guy !). The result is quite nice, yet this remix misses a bit the heavy punch delivered by the original thus losing on the energy. 6Blocc in his remix twisted the original bassline making it even more deep and heavy and added a few nice, fast punches. His tight edit rolls very smoothly and I’m positive it will be heavy rinsed in DJ sets across the world. Another interesting edit comes from a Canadian Ghislain Poirier. He based his rework on a pretty contagious guitar motive over which he laid the beats and pieces of the original track speeding up, slowing and cutting them up freely creating the most complex music piece in this package. D1 Product made a 4/4 stomp banger out of Art of Revolution. Not in my taste actually, but I can imagine (and will probably attend) the parties at which this track will attract the partygoers to the dancefloor making them beam with wide smiles. In general, this is one of the best music bundles I’ve heard in a while. In my opinion all remixes added some extra value to the anthem but still the Bassnectar’s original edit has won the battle. 8 stars out of 10 in Doktor Krank's ranking.